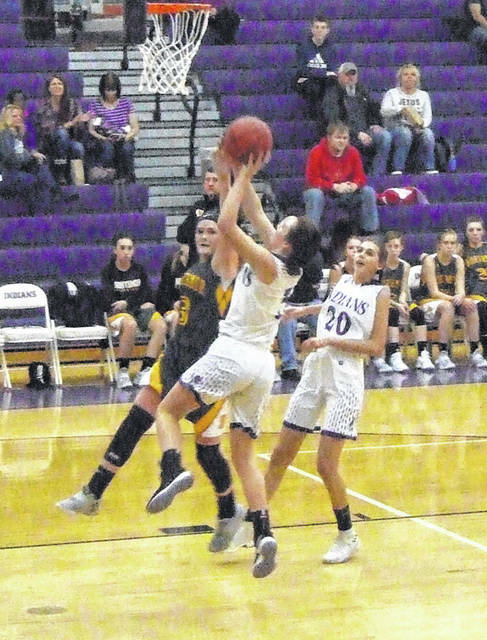 Mount Gilead’s Holly Gompf scored from both inside and outside in tallying 25 points in Saturday’s home win against Northmor. Julianna Ditullio goes up for a lay-up in action from Saturday’s game. Great shooting propelled Mount Gilead to a 62-50 win over visiting Northmor Saturday afternoon. The Indians got six three-pointers from Holly Gompf and three more from Dakota Shipman in lighting up the nets in the contest. Head coach Ryan Stover felt the efforts of those two girls, as well as Maddie Fitzpatrick, were key to his team’s win. After the two teams battled to a 6-6 tie over the opening minutes, MG got two free throws from Zoie Barron and baskets by both Fitzpatrick and Gompf to take a 12-6 lead. While the Golden Knights were able to get three-pointers from both Addie Farley and Reagan Swihart down the stretch in the quarter, they still trailed 17-12 after eight minutes as Gompf drained a three-pointer to barely beat the buzzer. Fitzpatrick opened the second quarter with a pair of baskets. After Lexi Winger scored from the field for Northmor, the Indians got a free throw from Samantha Sullivan followed by a basket by Shipman and a three-pointer by Gompf to lead 27-14. 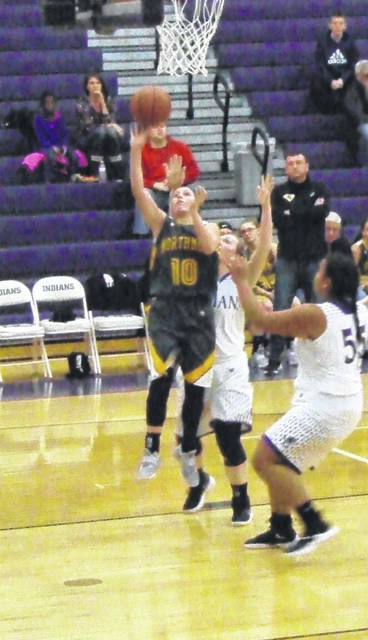 Farley would hit two three-pointers and a two-point shot and Macy Miracle added a put-back to bring the Golden Knights within a 30-24 score, but Fitzpatrick gave MG a buzzer-beating shot for the second straight quarter to send the Indians into the half up by eight. Four points by Julianna Ditullio helped keep the Golden Knights within a 36-30 margin in the opening moments of the third, but MG was able to get three three-pointers by Shipman in the period, as well as one by Gompf, to open up a 51-37 lead by the end of the period. Beachy noted that teams have had a lot of recent success from deep against his squad — something that mystifies him. After a basket and free throw by Shipman and a three-pointer by Gompf boosted the Indian lead to a 57-40 score, Northmor was able to get three points by Ditullio and two from Miracle to close within 12 with 4:48 to go. That would be as close as the game got, though, as MG maintained a double-digit lead over that time. Stover noted that the win will be helpful to his team as it jockeys for seeding position in the final week before the tournament draw is set. Northmor’s Farley led her team with 24 points, while Ditullio had eight. For Mount Gilead, Gompf finished with 25 points, while Fitzpatrick had 16 and Shipman finished with 14. Stover was very pleased with that scoring.